Exporting your photos with Polarr is easy, yet powerful with the included controls. When exporting in Polarr, you can do things like change image quality settings, image dimensions, and even add a watermark. Here's a quick overview of what you can do when exporting your photos with Polarr. The first thing you can adjust is the quality of the image you're exporting. You can choose between four preset image quality settings: low, medium, high, and best. You can also manually adjust the output by entering your own numerical value. You can easily resize, fit, or crop your photo when exporting. For example, if you're saving a photo to share on Instagram you might want to change the width of your image to 1080 pixels. You can do that with the resize control. Leave this section alone if you want your image to stay as-is. This section allows you to save your edits as a filter so that you can apply the same adjustments to any other photo in your collection. For more, read our entry on custom filters. The Watermark tab is where you can, surprise, apply a watermark to your image. 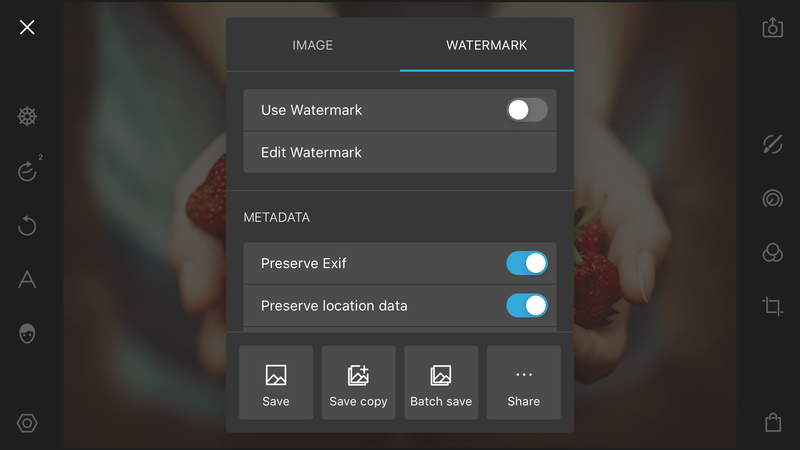 Tap "Use Watermark" to add a watermark to your photos. You can edit the watermark to supply your own custom watermarks. Polarr gives you control over the metadata in your images. 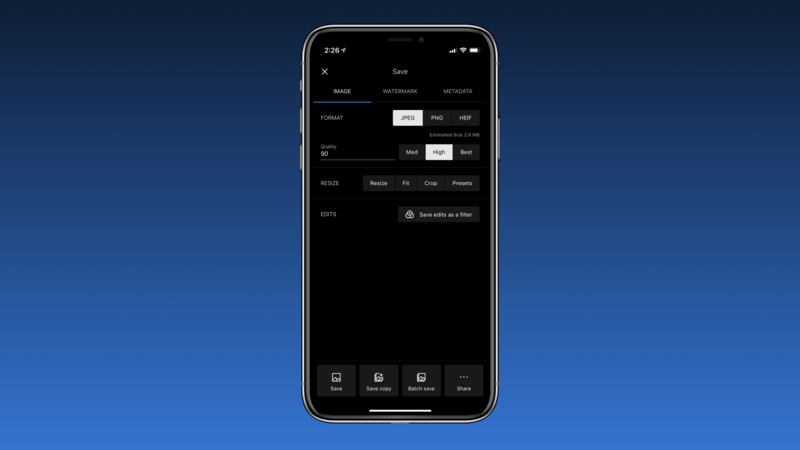 You can choose to remove Exif, location data or add your own metadata. Adding your own metadata allows you to supply your artist name, copyright information and a description of the photo. Here you'll go to export the image once you've made the changes to image quality and resizing that you want.